Nice work - by including the Federal Housing Finance Agency (FHFA) data SG get around the criticisms that the two Case-Shiller indexes (the "CS" runs in the graph) only represent a quarter and a third of the US population respectively; and that the NAR is simple marketing guild. The broadest-based FHFA data also shows affordability to be well above historic lows. 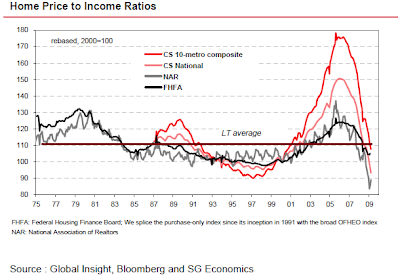 Which looks, well, curious if this is supposed to be real estate's near-trough during a an acute financial crisis. Still, the latest FHFA House Price Index (HPI) data point is out tomorrow [correction, today] and optimists will hope it builds on two months of...price rises! [Correction, the FHFA data fell sharpish]. Against that is the weight of inventory: Fannie and Freddie, and a few other lenders, ended a moratorium on foreclosures in March that had been in place since last November.